The latest rendition of the TFV12 Tank, the Smok TFV12 Prince Tank has a reduced 25mm base diameter along with several other improvements to make it great for daily use. Not only does it come with a standard 5ml tank, but it also includes an 8ml bubbled glass section for additional e-juice capacity. 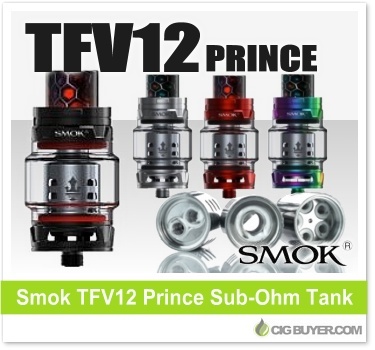 The Smok TFV12 Prince Tank is top-filled and incorporates new V12 Prince coils (0.4 ohm Q4 Quadruple Coil, a 0.15 ohm X6 Sextuple Coil and a 0.12 ohm T10 Decuple Coil) that can handle up to 120W of output power. It’s topped off with a widebore Cobra Drip Tip with dual adjustable airflow on the base.